It is a great pleasure for me to visit the beautiful University of Iowa in the blooming spring season. I would love to take this opportunity to share with you my thoughts on the new developments in China and China-U.S.relations. When it comes to the developments of China, I want to introduce to you the important effect of reform and opening up. Last month, President Xi pointed out at the Boao Forum for Asia that 1978 marked the beginning of China's historic journey of reform and opening-up. Our endeavor started from rural areas to cities, from pilot programs to nationwide projects and from economic restructuring to the comprehensive deepening of reform. Reform and opening-up over the past four decades has made great impacts on China. With united and determined efforts, the Chinese people have added a glorious chapter to the development epic of the country and the nation. China has grown into the world's second largest economy, the largest industrial producer, the largest trader of goods, and the holder of the largest foreign exchange reserves. Over the past 40 years, China’s GDP has averaged an annual growth rate of around 9.5% in comparable prices and its foreign trade has registered an annual growth of 14.5% in US dollar. The Chinese people have emerged from a life of shortages and poverty and are now enjoying abundant supply and a moderately prosperous life. According to current UN standards, more than 700 million Chinese people have been lifted out of poverty, accounting for more than 70% of the global total over the same period. Reform and opening-up is a great process that has seen China and the world achieve development and progress together. In this process, China has lived up to its responsibility as a major country. From "bringing in" to "going global", from WTO accession to the Belt and Road Initiative, China has made significant contribution to mitigating the Asian financial crisis and the global financial crisis. Contributing over 30% of global growth in recent years, China has become a key anchor and driver for the world economy and a positive force in advancing the noble cause of global peace and development. We can fairly say that reform and opening up is the key to China’s continuous development. Based on the development achievements in the past 5 years, the 19th CPC National Congress that was just concluded made an important judgment that the socialism with Chinese characteristics has crossed the threshold into a new era. In this new era, while taking into consideration of the international and domestic situation and China’s development conditions, the CPC introduced a two-step approach to build China into a great modern socialist country that is prosperous, strong, democratic, culturally advanced, harmonious, and beautiful. In the first stage from 2020 to 2035 based on China’s completely building of a moderately prosperous society in all respects, we will basically realize socialist modernization. In the second stage from 2035 to the middle of the 21st century, we will build China into a great modern socialist country that is prosperous, strong, democratic, culturally advanced, harmonious, and beautiful. By then, material, political, cultural and ethical, social and ecological civilizations will be comprehensively improved, modernization of governing system and capacity will be realized, and China will become a country that leads in comprehensive national strength and international influence. The goal of common prosperity for everyone will be basically realized. In this new era, the ruling party CPC came to a clear understanding that the principal contradiction facing Chinese society is that between unbalanced and inadequate development and the people's ever-growing needs for a better life. At the same time, our country is still and will long remain in the primary stage of socialism, and China's international status as the world's largest developing country has not changed. The CPC proposes that China will focus on the issue of imbalanced and inadequate development by further promoting development, improving development quality and efficiency, and meeting the ever-growing economic, political, cultural, social, and ecological needs of the people, so as to promote well-rounded development of the people and the society. We will unswervingly adhere to the concept of innovative, coordinated, green, open and shared development, and push forward industrialization, IT application, urbanization and agriculture modernization in parallel. What do the five development concepts mean? “Innovation” aims to implement the innovation-driven development strategy. Innovation is the primary driving force behind development. China will promote innovation in theories, institutions, science and culture, and speed up the effort to build itself into a country of innovation. China will encourage more social entities to make innovations and start businesses, build an innovative workforce, and create new drivers for economic growth in an innovative way. “Coordination” aims to promote the coordinated development between urban and rural areas and the coordinated development between economy and society. So far, China has remained the largest developing country in the world. With a population of 1.3 billion, China rises to the challenge of low living standard and wide gap between the urban and rural development. Under the guidance of the coordination concept, we are supposed to propel the new industrialization, IT application, urbanization, and agricultural modernization. “Green development” adheres to the basic national policy of resources conservation and the environmental protection. We will stick to the sustainable development and the civilized development path of production and development, pursue a well-off life and healthy ecological environment, and accelerate the construction of a resource-saving and environment-friendly society, thus creating the new pattern of modernization that realizes the harmony between the human and nature, promoting the construction of a beautiful China, as well as making new contributions to the global ecological security. China will continue to persist in the green low-carbon cyclic development and take the initiative to deal with the issues of climate change and excess capacity. “Sharing” is to enhance the well-being of people. China will proceed to enlarge investment in people’s livelihood, and continuously improve people’s living quality, the education, health care, social insurance and other public service systems, and increase the proportion of middle-income earners. At the same time, the justice and equity is another significant issue, which suggests we must appropriately share the benefits gained from the development, and start with issues that are in the immediate interests and are of the top concern of people, so that the fruits of economic development and reform and opening–up can be equally shared. “Opening” is to pursue a mutually beneficial and win-win strategy, which is China’s strategic choice. The reform and opening-up strategy has been carried out, therefore, once the door is opened, it will not be closed. We must keep up with the trend of in-depth integration of China’s economy into the world economy, and adhere to the coordination of internal and external demand, balance of imports and exports, implementation of both the“bring in” and “go global” strategy, as well as simultaneously attract the investment, technology and talents. In addition, a higher level of open economy must be developed, and then people can actively participate in the global economic governance and the supply of public goods, thus building an extensive community of interests. What has happened proves that opening-up was key to China's economic growth over the past 40 years and in the same vein, high-quality development of China's economy in the future can only be achieved with greater openness. Opening-up is a strategic decision made by China based on its need for development as well as a concrete action taken by China to move economic globalization forward in a way that benefits people across the world. President Xi announced at the Boao Forum for Asia that to further open up, China will significantly broaden market access, create a more attractive investment environment, strengthen protection of intellectual property rights (IPR) and take the initiative to expand imports. President Xi emphasized that with regard to all those major initiatives of opening-up, we have every intention to translate them into reality, sooner rather than later. We want the outcomes of our opening-up efforts to deliver benefits as soon as possible to all enterprises and people in China and around the world. We believe that a stably developing China in the new era will bring more certainty to the world that is infused with uncertainty and instability, and render powerful support to world peace, development and stability. ---We believe that China’s development potentials will bring unprecedented opportunities to the world. From now on to the middle of the century, China will develop from building a moderately prosperous society in all respects, basically realizing socialist modernization, and to building a great modern socialist country. This blueprint points out a way for Chinese people to realize common prosperity and enjoy better lives, and also marks China’s greater capability and bigger role as a driving force for global economy and common development. ---We believe that China’s cultural advances will offer a new and attractive option to human society. China’s development draws on all great cultural achievements while staying committed to a path commensurate with its own national conditions. China’s success has presented a new viable path to developing countries to achieve modernization, and offered a new example to countries and nations that aspire for fast development while maintaining independence. China’s development does not copy other’s models, and always respects and encourages other countries to choose their own development paths suitable to their national conditions. China is willing to contribute the Oriental wisdom to the progress of human civilization. Next year will mark the 40th anniversary of the establishment of diplomatic relations between China and the United States. Thanks to joint efforts of successive leaders and people of both countries, China-U.S. relations have achieved historic development and grown into the most important bilateral relations in the world. In 1979, the official exchanges between China and the United States were numbered. Today, the high-level exchanges between China and the United States are close and the dialogue mechanism is smooth. China and the United States have established over 100 inter-governmental dialogue mechanisms, including the strategic dialogue and people-to-people exchange mechanism, the China-US Joint Commission on Commerce and Trade (JCCT) and so on, covering political, economic, security, cultural, science and technology and other fields. Since President Trump assumed office, China and the US have set up four high-level dialogue mechanisms covering diplomacy and security, economy, law enforcement and cyber security, as well as social and people-to-people exchanges. So far, there are 47 pairs of friendly provinces-states and 215 pairs of sister cities between China and the US. In 1979, bilateral trade between China and the US was only $ 2.45 billion, and direct investment between them was zero. In 2017, Sino-US bilateral import and export of goods amounted to $ 636 billion. China is the third largest export markets and the largest source of import of the United State, and maintains as the largest trading partner of the US. On the other hand, the US has become the largest trading partner, the largest export market and the fourth source of import of China. In 2017, bilateral two-way investment amounted to $ 213 billion, and Chinese companies invested $ 29 billion directly in the US. In 1979, less than 10,000 people in China and the US visited the other country. In 2017, 6 million people from the two countries came across the Pacific Ocean. In 1979, student from Chinese mainland was hardly seen in any American university. Nowadays, 330,000 Chinese students are studying in universities in the United States, accounting for one third of the America’s foreign students and the largest group of international students. 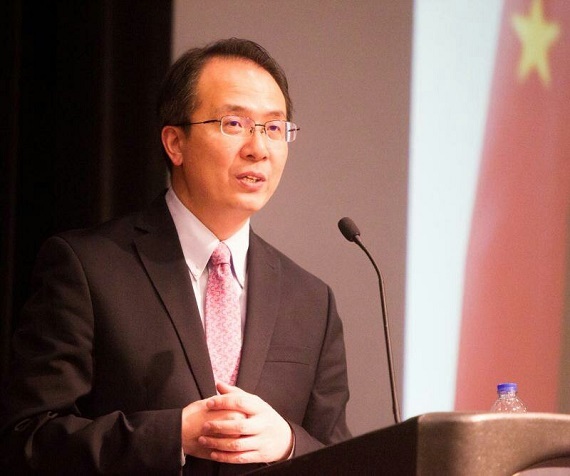 Sino-US economic and trade relations are highly complementary and interdependent. The exchanges between the two countries in education, tourism and other fields have enhanced mutual understanding between the two peoples and deepened the cultural exchanges and cooperation between China and the United States. Regarding major international and regional affairs, China and the United States have maintained effective coordination and played important roles. This fully shows that their common interests of China and the United States far outweigh the differences. Cooperation between the two countries is conducive to global stability and prosperity, and also in line with the expectations of the two peoples and the international community. Sub-national cooperation is the foundation for friendly China-US relationship and an inexhaustible power to drive forward the China-US relations. The healthy and sound development of bilateral relations boils down to support from people and sub-national level, and the development will eventually serve the people and sub-national level. The cooperation between China and the nine Midwest States within our consular district has expanded at a grass-root level. The economic and trade cooperation has deepened and people to people exchanges have become increasingly close and frequent. 15 sister province/state relations and 40 sister-cities relations have been set up between the two sides. Last year, trade volume between China and the 9 states within the Consular District surpassed 90 billion US dollars. In the 21st century, China’s cumulative investment in the nine states has exceeded 20 billion US dollars, which has created more than 45,000 jobs. Companies like Wanxiang each employs over 5,000 local workers. Many large projects have broken ground, including the CRRC rolling car assembly plant. There are 80,000 Chinese students and 19 Confucius institutes in the nine states. Since I assumed office, I have visited governors of the nine states in our consular district and officials in charge of economic affairs, trade and investment, and strongly felt their strong willingness and dedication towards developing relations with China. Governor Bruce Rauner of Illinois, Governor Rick Snyder of Michigan, Governor Kim Reynolds of Iowa and Governor Eric Greitens of Missouri visited China last summer, giving a strong push for the cooperation and exchanges between China and the Midwest States. Chairman Emeritus of Chicago Mercantile Exchange Group Leo Melamed told me that China will be America’s economic partner for the next 50 or even 100 years. I completely agree on his opinion. First, stay committed to the right choice of strategic partner, not rivals. The past history of China-US relationship reveals that China and the US can be partners for cooperation, and that both countries will gain from cooperation and lose from confrontation. China and the US should work as one to firmly pursue cooperation, and build a closer, more expansive and in-depth partnership featuring win-win cooperation. It’s natural that there could be some competitions between our two countries. However, this kind of competition is not like boxers seeking for knocking down the other side. Instead, it is like two runners running towards our set goals together. And during this process, achieve each other’s development and improvement of people’s living standards. Competition between the two countries should not lead to conflict and confrontation. Instead, such competition should make our two countries more competitive and seek and deepen our cooperation and strengthen our partnerships. Second, stay committed to the recognition direction of enhancing mutual trust, not suspicion. There is no cooperation without mutual trust, and mutual trust comes from mutual understanding. To avoid misunderstanding and misjudgment, China and the US should view each other’s history, culture, politics, diplomacy, economics, society, military and development strategies in a holistic, objective and reasonable manner. The goal of China's development is to surpass oneself rather than overwhelm the United States. China does not have the intention of replacing the U.S. leadership. We are willing to work with the U.S. to safeguard the world order with the propose and principles of the UN charter as its core. The United States should abolish zero-sum and Cold War thinking. Third, stay committed to the way of mutual respect, not ignoring core interests of each other. Whether it be people or countries, friendship starts from respect. It is only natural that China and the US have differences, and the key is to respect each other’s core interests and major concerns. There will be no sound and steady development of China-US relations once the political foundation of bilateral relations is at risk. We hope the U.S. side can handle Taiwan issue carefully. That is the red line can never be touched. Fourth, stay committed to the mutual beneficial road of increasing common interests, not resorting to unilateral protectionism. China and the United States are the biggest trading partner of each other. It’s natural we have some divergences. What is important is to continue to expand common interests, the scale of trade, and mutual investment, and to formulate better policies and create better conditions to achieve those goals. Trade wars and protectionism will only undermine the cooperation atmosphere between the two countries and create more problems. This will not only solve the problem, but just result the two sides in losing the future opportunities in the other market. The development of China-US relationship counts on the support of each of us. As long as the two countries continue with mutually beneficial cooperation and the two peoples enhance mutual understanding, we should be fully optimistic about and confident in the bright future of China-US relations.